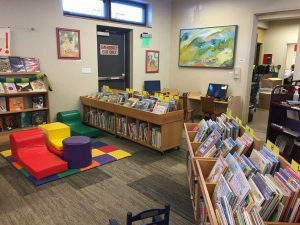 The Nederland Community Library empowers our community to learn, connect and grow by providing equal access to information and resources and compassionate service to all. Service: We provide compassionate, respectful, and equal service to whomever walks through the door. Community: When planning or making decisions, we always have the community in mind. We are engaged in an ongoing conversation with the community on what they want and need. Adaptability: We are responsive to changing needs and adapt our spaces, resources, and programs. 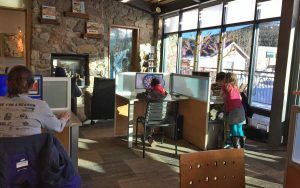 Equal Access: All information resources, regardless of technology, format, or methods of delivery, are readily, equally, and equitably accessible to all library patrons. Intellectual Freedom: We provide free and confidential access to information within federal laws. 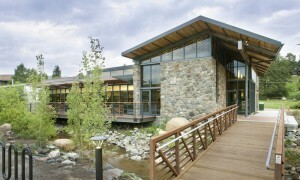 the library is a hub and a place where community is built. Goal 1. Spaces: Provide library spaces that are inviting, stimulating and comfortable for a wide variety of uses. Utilize the land next door in a fiscally feasible manner for the short term while maintaining a long term vision for it. Develop policies and marketing for the meeting room so that it is used most nights of the week. 1.3 Adapt / modularize the existing building to meet a variety of needs. 1.4 Facilitate the use of the porch. 1.5 Install a solar electricity system. 1.6 Have a stable and functional HVAC system. 1.7 Minimize the library’s environmental impact. Goal 2. Materials: Ensure that our community has access to resources in a variety of relevant and useful formats. 2.1 Continue to purchase print and electronic materials for both education and recreation. 2.2 Expand our offerings of non-traditional items within our staff capacity: e.g. a tool library. 2.3 Offer databases that are relevant to and used by the community. 2.4 Evaluate material usage and ask / survey the community for their needs on an ongoing, regular basis. Goal 3. Equality: Provide information literacy and job skills training in pursuit of a secure, informed, and technologically capable community. 3.1 Offer access to the internet both inside and outside the library (WiFi hot spots and new technologies). 3.2 Continue to provide training on both physical devices and online / software resources. 3.3 Provide resources for job seekers and those seeking job training. Goal 4. Programming: Provide programming for patrons of all ages and backgrounds that educates, informs, and helps build community. 4.1 Focus on providing early learning experiences as they have lifelong impacts and develop lifelong learners. 4.2 Evaluate programs and ask the community what type of programming they want on an ongoing basis. 4.3 Offer programming outside the building. 4.4 Seek out collaboration and partners where it makes sense. 4.5 Record programming when feasible to share online. Goal 5. Trusted Resource: Become known as a top resource in the community. 5.1 Listen to the people that we serve. 5.2 Get a clearer picture of the different user groups. 5.3 Create a marketing plan to engage key audiences. 5.4 Communicate through relevant communication channels for each target audience. 5.5 Find new avenues to share stories of what the library is doing, e.g. publish an annual report. 5.6. Leverage personal and social networks to reach out to people. Goal 6. Staff and Volunteers: Support a staff that is enriched through professional development and training and who are enthusiastic to see the library thrive and achieve the goals. 6.1 Staff provide exemplary customer service to everyone who walks through the door. 6.2 Staff have expertise in their jobs and are supported with continuing education and training. 6.3 Expand staff roles to help with programming – design, setup and execution. 6.4 Continue the volunteer program that is essential to the library’s functioning and success. Goal 7. Sustainability: Ensure adequate funds to achieve the goals of this plan and ensure a sound financial trajectory into the future. 7.1 Be financially stable and fiscally transparent. 7.2 Fund additional staff if necessary. 7.3 Engage the Foundation in targeted fundraising activities. 7.4 Seek additional funding through grants for specific needs. 7.5 Invest savings to gain a higher yield in compliance with all applicable laws.